Saudi Aramco inspires passion in its people by offering them the opportunity to do the work they dreamed of doing, and by supporting them in achieving more than they thought possible. Its employees derive a sense of purpose from knowing their work has the potential to make a positive difference on a global scale. By creating the conditions for its people to follow their passion with a clear purpose, Aramco cultivates a high-performance workforce ready to take on any challenge. Every day, its team of more than 65,000 people combines passion, purpose, and performance to achieve a common objective: Unlocking the full potential of the kingdom’s resources to create more opportunities for people at home and around the globe. Aramco’s ambitious goal to become the world’s leading integrated energy and chemicals company requires the skills of a diverse range of technical and professional specialists to help the company carry out its core functions, as well as a host of other enabling activities such as establishing partnerships, nurturing investment, contributing to the development of the kingdom, launching new businesses, entering new markets, and delivering innovative technologies. To support its people in such a dynamic and fast-paced workplace, Aramco runs the world’s largest corporate training programme and fosters a continuous learning environment. From its youngest recruits to its experienced professionals and senior leadership, Aramco offers capacity building programmes tailored to help them meet the growing responsibilities linked to its evolving business. And because Aramco has its eye on the future, it actively identifies and develops high-achieving Saudi high school and college students by helping to equip them with the specialised and soft skills required for success. Whether they ultimately work for the company or for another company, or follow their own entrepreneurial aspirations, Aramco helps prepare them to make meaningful contributions to the local economy. The ability to attract, develop, and retain top talent is a critical differentiator in competing effectively on a global level. Today’s top performers are looking for opportunities to do the best work of their careers. They want to work for companies whose values, purpose, and ambitions match their own. 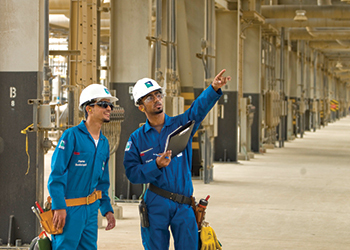 In 2015, Aramco’s workforce grew to another all-time high of 65,266 of the best minds in its industry. These individuals are attracted to its company because of the values Aramco upholds, its belief in merit-based performance, and its culture of innovation. They stay because of the opportunities Aramco provides for them to achieve unprecedented success in their field of expertise – either individually or as a valued member of a multidisciplinary team. Aramco is an energy company powered by the creative and intellectual energy of its people. Through the fusion of energy, people, and ideas, Aramco was able to transform its aspirations into reality in 2015. Aramco knows that with the right support and an empowering work environment, there is no telling where an idea one has today will lead one tomorrow. To enable its people to do their best work and improve efficiency, Aramco continually upgrades its corporate management systems. Aramco continued to implement its Enterprise Risk Management framework to enable it to respond more rapidly to complex and challenging resource requirements and operating environments. By providing a better understanding of risks and risk-reward tradeoffs, Enterprise Risk Management empowers informed decision making and in 2015 it allowed its workforce to better weather market dynamics and continue delivering on its business objectives. 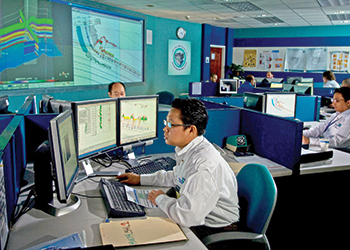 The framework is being integrated into its corporate planning and accountability process so Aramco can control and mitigate unexpected events that might impact security, employee safety, the environment, and operational reliability – factors that may hinder the company from achieving its strategic intent. Aramco continued to pursue its Capital Efficiency Initiative by rolling out its Capital Management System to ensure capital projects are aligned with corporate targets. Within this system, Aramco analyses projects to establish optimised portfolios that account for different conditions, providing flexibility to adapt to changes in global economic cycles by reprioritising projects and efficiently deploying resources. Its efforts to improve capital performance are combined with its drive for operational excellence to identify gaps, define areas for improvement, and realise new efficiencies. The structured approach and relentless focus on results afforded by the operational excellence system empowers its people to sustain optimal performance across its company in reliability, safety, and cost efficiency. By the end of the year, more than 920 employees had been certified as operational excellence assessors. Aramco is building a high-performance mindset across the enterprise by challenging and rewarding its people. Four critical behaviours – people conversations, empowerment, collaboration, and decision making – form the basis of a results-based work culture. To help instill these behaviours, in 2015 Aramco held 45 interactive forums, trained 170 champions, and delivered targeted communications to all employees and leaders. Aramco also delivered targeted workshops to 22 organisations, reaching 20,000 employees across the company, and a two-day performance management education programme for 943 leaders to drive accountability and engage employees. Delivering on its intent to become the world’s leading integrated energy and chemicals company requires more than investments in technology and capital projects – most importantly, it requires investments in people. Underinvestment in talent only amplifies the cyclical nature of its industry. To ensure Aramco meets its aspirations, the firm emphasises continuous development and skill building to drive performance through a wealth of courses, training centres, internships, and mentorship programmes to pass on knowledge to the next generation. Aramco is an energy company powered by the power of its people. In 2015, Aramco sustained its momentum to recruit candidates best matched to meet its requirements and achieve its aspirations, adding 2,185 new employees. In addition, 3,774 apprentices and 383 graduates of its College Degree Programme for Non-Employees joined the company, bringing the overall total of people joining its workforce to 6,342. Aramco continually evaluates its human resource development programmes and seek new opportunities to involve local service providers. In 2015, Aramco began to phase out a legacy vocational training programme with its new Industrial Sponsorship Programme, created in partnership with the Colleges of Excellence, the kingdom’s leading authority for applied training. The new programme will sponsor high-achieving male and female students during their second or third year at intermediate colleges and institutions who are studying majors aligned with its critical skills requirements, with the intent of hiring them once they graduate. Aramco launched an initiative to replace traditional text-based instruction in its Apprentice Programme for NonEmployees with integrated smart learning environments centered on interactive engagement. By year-end, Aramco rolled out five smart learning courses for roughly 3,000 of the more than 7,800 apprentices enrolled in the programme. Since the programme’s inception, more than 28,000 participants have graduated, creating a wealth of talent developed from within the company. The growing complexity of its business requires a workforce with higher skills. To attain this level of talent, Aramco supports academic development through a suite of programmes designed for Saudi non-employees who, upon successful completion of their degrees, may be offered positions in the company. The College Preparatory Programme readies young people to excel in their studies while the Associate Degree Programme and the College Degree Programme provide support while at school. More than 5,000 college students have graduated under these programmes to date and joined the company’s professional ranks. In 2015, Aramco overhauled the degree programmes, mandating enrollment in the top 200 universities worldwide and establishing the Al Ruwwad (Arabic for 'The Pioneers') programme designed to achieve early acceptance for students in selected schools. Overall, in 2015 more than 2,000 Saudi students sponsored by Saudi Aramco were studying in leading universities in the United States, Europe, and Asia. The skills and experiences they gain help empower the next generation of its company’s leadership. Enhancing its development programmes and establishing new initiatives for shaping the next generation of Saudi talent ensures its workforce will continue to advance the standards of excellence in its industry for the benefit of the kingdom. During 2015, Aramco pursued a wide spectrum of initiatives designed to raise the professionalism and technical proficiency of its employees. The company strengthened relationships with domestic and international businesses and universities to build skills and enrich the learning experience of its increasingly youthful workforce. In-house, Aramco continued to strengthen and expand its interactive training environments, online course offerings, and professional development courses. Aramco’s Young Leaders Advisory Board, known as YLAB, provides its young professionals with a platform for active engagement with management on a wide range of issues. Composed of 16 men and women serving 18-month terms, YLAB explores creative solutions for improving work processes, raising performance levels, and motivating other young employees to pursue excellence in their careers. The programme has been benchmarked as a best practice by other firms and government agencies in the kingdom. In 2015, its Upstream Professional Development Centre (UPDC), dedicated to bridging the knowledge and skills gap between veteran upstream personnel and newer staff, conducted more than 430 training sessions for more than 7,200 participants and facilitated 280 petroleum engineers receiving certification from the Society of Petroleum Engineers. The centre also commenced a systematic onboarding programme, guiding more than 170 new employees in three cohorts through three 11-week sessions. More than 1,000 employees have participated in this programme to date. In addition to sponsoring employees to study at overseas universities, Aramco also offers a suite of academic programmes from leading universities and training institutions tailored to meet its specific needs through its Hosted University Programme. By hosting international degree programmes in Saudi Arabia, Aramco gains economies of scale and cost efficiency, improves its skills base, and facilitates knowledge transfer to the kingdom. 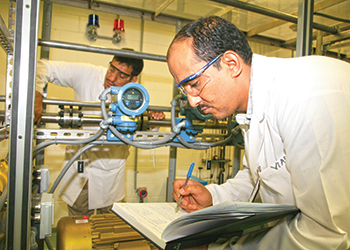 In 2015, Aramco established two new master degree programmes. The company began offering a programme in pipeline engineering under a collaborative arrangement with the University of Northumbria and Penspen Integrity, a world leader in pipeline training. With IFP Energies Nouvelle, an internationally renowned research and training organisation based in France, Aramco launched a programme in refining and petrochemicals to help equip the future leaders of its downstream business with the tools for managing increasingly complex technologies and markets. Its Women in Business programme focuses on the professional development of its female employees and helps young women become more empowered and able to capitalise on their strengths. In March, Aramco marked the fifth anniversary and 50th session of this proven programme, which has served nearly 850 female employees since its inception. Its journey to become a global integrated energy and chemicals enterprise also requires building international business and industrial acumen, skills not so easily learned in traditional classes or training programmes. 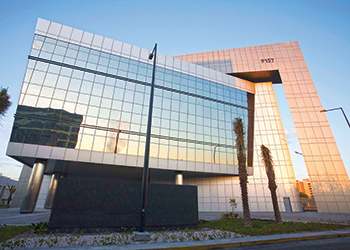 Many of its leaders are assigned multi-year positions with its Aramco offices in Asia, Europe, and the United States. Professional staff gain similar experience through internships in North American companies in the manufacturing, energy, financial, information technology, telecommunications, and medical sectors. Its Houston office has arrangements with roughly 200 host companies, and over a span of two decades, more than 1,000 professionals have participated in the internship programme. In 2015, nearly 150 company professionals were on assignments of up to 18 months. Aramco develops leaders who motivate their teams to pursue excellence and realise the potential opportunities created by achieving its strategic intent. Its Leadership Series for Managers, initiated in 2014, provides leaders with enhanced core capabilities. In 2015, 40 managers and 431 front-line division heads and supervisors attended a series of workshops while its Advanced Manager programme honed the leadership skills of 51 participants – a process that helps create a pipeline of talent to guide the company’s future performance. Technical skills alone will not enable the company to achieve its strategic intent: Its leaders need to be able to communicate effectively, forge collaborative teams, make critical decisions, and empower and inspire their teams. To instill these talents in its supervisors and foremen, Aramco operates the Leadership Programme for Industrial Unit Heads, a three-month training programme that thus far has graduated more than 260 participants. Collaboration is at the core of its global research network. Its pioneering Research Leadership Development Programme cultivates critical leadership qualities in its R&D Centre leaders, developing essential skills for fostering a culture of innovation. The first programme, conducted in three phases over four months, is under way in Dhahran with a cohort of 23 selected participants from across its global research network. This leadership programme is envisioned as a key driver in its transformation to become a global leader in advancing technology breakthroughs in its industry. Since 1951, Aramco’s Home Ownership Programme has financed more than 64,700 new homes for Saudi employees. In 2015, Aramco introduced several enhancements to the programme, including increasing the minimum and maximum financing amounts for homes and extending benefits to apartment ownership. Aramco conducted 60 awareness sessions on the updated programme for roughly 3,000 eligible employees. The first phase of its South Dhahran Home Ownership Programme, comprising more than 2,700 housing units, is on track for completion in 2019. A planned sustainable community, South Dhahran will meet high energy-efficiency standards and feature mosques, open green space, and bicycle and walking paths to offer a template for housing development in the kingdom. Healthy, safe, and vibrant communities are a prerequisite for the well-being of employees and their families. Beyond providing essential services for its employees, its communities also serve as models of environmentally sustainable living through the use of energy efficiency technologies, water conservation practices, and recycling programmes. In 2015, Aramco marked considerable progress in the expansion of its residential communities to accommodate its expanding workforce. It continued work on the expansion of its Dhahran residential community, with more than 1,500 housing units planned to be ready for employees and their families by 2018. New company housing in Shaybah and Tanajib was finished in 2015, with additional housing units in Ras Tanura and ‘Udhailiyah in the planning and design stage. The energy industry is undergoing a period of unprecedented change. New technologies and methodologies are changing the ways Aramco discovers and produces oil and gas resources and derives additional benefits from this energy. It is a time of great opportunity for those with the drive to make the breakthrough discoveries that will spur new ideas and new possibilities. Saudi Aramco believes the talents it needs for tackling future challenges are found in its people. That is why Aramco created the Upstream Professional Development Centre (UPDC): To provide an integrated training programme that combines technical depth and breadth with mentoring programmes to prepare its workforce for the unique challenges that lie ahead. Essentially a corporate university with instructional materials developed to match the specific needs of upstream professionals, the centre provides participants rewarding opportunities to bridge experience and knowledge gaps across multiple upstream disciplines. The centre offers innovative training and bonding networks that promote learning and collaboration to help young professionals tap into the vast well of knowledge acquired by senior professionals over years of service. With more than 7,000 participants receiving training in 2015 alone, the Upstream Professional Development Centre creates individual development plans for employees across nine disciplines: Drilling, facilities engineering, geology, geophysics, petrophysics, production engineering, reservoir engineering, unconventional resources, and upstream computing. The centre’s facilities include cutting-edge 3-D imaging environments that virtually immerse students inside oil and gas reservoirs deep underground, realistic drilling simulators, and computerised core sample analysis tools. Combining interactive classroom instruction with practical problem solving, the centre’s instructors prepare young employees for future challenges.